The filling of a pillow is an essential factor which plays a vital role in the functionality of it. The most common types of fillings include memory foam, polyester fiber, microbeads or air. Due to its unique conforming nature which molds around the neck, shoulders, and head, whilst providing a reassuringly firm support, memory foam is considered to be the most reliable solution to all your travel rest problems, while it is found to be cheap as well. Another highly liked & favored pillow filling is polyester fiber, which although isn’t as smart as the compliant memory foam, it has a long life and found durable, resistant to stretching and shrinking, retains its shape, and is low maintenance. Micro-bead fillings are uniformly shaped polymer white beads which are considered amazing for side sleepers. These help in avoiding any bed bugs, mites or dust hence preferred by many. Lastly there is air, which is often a great choice because an inflatable travel pillow filled with air can be adjusted to suit the firmness level for everyone throughout the length of a journey, which for long-haul flights is very important. The various sizes for a travel neck pillow aren’t constant as they are in bed sizes. Due to the variation in shape, usage, functionality, each one should have its own dimensions listed separately as part of the specification. In general, the adult U shaped pillow is an average of 10″ x 12″ in length and width, and approx 3-5″ in height. A kid’s version is much smaller and averages around 9″ x 9″ length and width and 3″ height. In terms of weight, which is a rather important characteristic of this product, the average weight of an adult’s size is approximately 8 ounces, and a kid’s size is slightly less at 5 ounces. For obvious reasons the lighter the product the better; a lesser load to bear on the shoulders means a more weightless feel to the product, which in turn causes less irritation and improves quality of sleep. From this table below you will be able to choose the best travel pillow that will give you a value for your money. 1. It’s really small. So small that it can hardly be called a pillow at all, it’s more like a little neck rest. It does boast that as a positive feature, being 80 percent smaller than regular travel pillows means that it will fit in most carry-ons. And if it doesn’t, it comes with a carrying pouch and a carabiner so you can conveniently hang it on your bag, backpack or carry-on luggage. 2. It’s not a traditional squishy pillow. It’s actually made of hard plastic and memory foam for a sleek look. And it was named for an animal with a very strong neck, so how much manlier can you get? 3. It’s cool-looking. It comes in a predominantly grey color with either blue, yellow, orange or darker grey trim. Grey is the color of many business suits, right? So the whole dork factor of carrying around a big soft pillow is totally erased by the Bull Rest. Just think of it this way, it’s a pillow that the CEO of Fortune 500 companies would not be embarrassed to be using. 4. According to the descriptions, it includes “Travel Dignity”, and the Wall Street Journal called it, “The Neck Brace from Heaven”. See what I mean? It’s so cool that the WSJ isn’t even calling it a pillow! So, I’m not a businessman, but I really do understand the appeal of the Bull Rest. I can imagine how convenient it must be to have such a small pillow to take along with you, especially if you take frequent flights for work. The Bull Rest has a hole in the middle, specifically made to keep your neck cool. Now, this is something I’d definitely appreciate, since one of the biggest complaints against travel neck pillows, no matter how good they are, is that your neck can get warm when you use them. So, warm neck equals less sleep, which kind of defeats the purpose. It’s made of memory foam for maximum comfort. It was designed by medical engineers, who, say that the “Bull Rest functions by actively supporting the occiput (skull) against your trapezius (shoulders). This allows the product to support the vertebrae C1-C7 in correct alignment as you sleep”. It’s (hand) washable, or you can use wipes or a moist cloth to clean it. It’s small enough so that your favorite noise-canceling headphones fit over it. It comes with a microfiber carrying case, the carabiner loop, and a 30-day warranty if for some reason you don’t like it. It’s supposed to be the right size for 85 percent of adults. The Bull Rest sounds like a really appealing pillow for businessmen on the go, and I can understand why they’d pay fifty or even sixty dollars for this item. Hey, it worked for the writer of WSJ. But I tried to get as many opinions about the product as I could, and some users have had a couple of caveats about it. For one thing, a number of people found that it was way too small for their necks to get a proper rest. It does, after all, advertise that it’s a whopping 80 percent smaller than other travel pillows. The second thing is that, unlike some travel pillows that have strings to tether it to an airplane seat, the Bull Rest is supposed to stay between your neck and the seat back, and some people said it kept slipping down, which as we can all imagine, did not contribute to a good sleep. The third major critique of the product is that people found it to be a little pricey. The people who love the pillow REALLY love it, though. It doesn’t only appeal to people who travel a lot, but several people who have neck issues have written about how comfortable it is to their necks, and that they wake up refreshed and pain-free. Some people even use it at home, which says a lot about the Bull Rest. This next pillow is really exciting. It’s still not widely available, but you can already order it on its crowdfunding page, which you’ll find here. 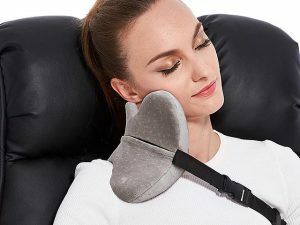 It’s already raised almost 800 percent of its funding goals, which tells me that I’m not the only person excited by a pillow that will, during a long and painful flight, massage your neck and apply heat where you need it. Cool, right? Made by Arnimate, an American company that created other travel accessories, this pillow is covered by soft plush material and wraps completely around your neck. It boasts of 6 massage modes and 3 heating modes. The manufacturer claims that the pillow solves common problems such as neck pain, sleep disorders, spinal curvature, headache, tension in the shoulders, fatigue, stress, and irritability. Sounds like a tall order for one single pillow, don’t you agree? Memory foam construction. The Vasco pillow is supposedly constructed in such a way that it “supports the proper alignment of your neck”. Apparently, with this pillow, the vertebrae that are most complained of – namely the C4, C5, C6, and C7 – stay in the right alignment and are kept from grinding against each other, which means that users of the pillow stay free from pain. The manufacturers also claim that the memory foam will always go back to its shape, even for 10 to 15 years. The massage system. 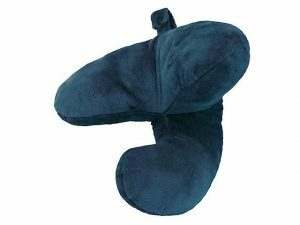 The Vasco pillow has a special massage function designed for comfort and relief from the pains and aches of traveling. It uses an “a rhythmic pattern of massage that replicates a traditional, deep-tissue Shiatsu massage”. This pattern is meant to relieve neck pressured stress and cause tension in the trapezius and neck muscles to be released. As the manufacturer says, “It’s like having a personal masseuse on your entire flight”! The heating system. The pillow uses heat therapy to encourage blood flow throughout the body. And so, even with limited movements on the plane, the heat from the pillow is supposed to stimulate healthy circulation, causing you to feel energized and refreshed. Hypoallergenic and ultra-soft material for maximum comfort. Okay, the VascoPillow seems pretty impressive and I would love to try it. As a woman who travels a lot and who really loves a good massage and heating pads, this product appeals to me. I hope it delivers what it promises. I just have to say right away that this Banale’s Omni-Pillow gets top marks in my book for versatility. It’s very new, and is not out on the market yet, but has been reviewed already and is available for buying on their crowdfunding page. Pretty neat, right? No wonder it reached way beyond its crowdfunding goals. Its smart design allows you to fold the Omni into a very small package, “the size of a mango” as the manufacturer says. (Admittedly, though, it has to be a very big mango, the green and red ones you find in your local Aldi, not the sweet yellow ones from Thailand or India.) It also packs conveniently into a 15 cm waterproof bag that you can easily fit into your backpack, purse or carry-on, that comes with a hook that can be attached to your bag, for the adventurous types out there. When it functions as a neck pillow, it has a pocket for your phone, with a slot for your earphones for easy access. There’s also a blanket catcher tab on the side — I haven’t figured out what it’s for, but I think you hook your blanket to it so it doesn’t slide off of you when you sleep? I don’t know. If you figure it out, tell me! As a double pillow for lying on, you fold the length of the pillow in half and secure it with the elastic band so that it stays folded, which gives you a nice thick surface for sleeping. Or you can also stick your hand in the middle and use the pillow for power napping on your desk or the tray in front of you on an airplane seat. Finally, as a pillow topper, it can add extra thickness to your favorite pillow at home, adding a 1 and 3/4 inch of memory foam to it. The elastic bands come in handy for securing the Omni to your regular bed pillow. Okay, so far so good. So versatile. It looks well-engineered and designed. I like it that you can use it for regular travel as well as for adventurous camping trips. It comes in three different color combinations—pink and black (or “azalea”, as the crowdfunding page reads), blue and black (“oceano”) or grey and black (“notte”). Hey, it’s Italian! Another plus is that while it’s still in the crowdfunding stage, you can get the Omni for 45 €, instead of the regular price of 79 €. And if you buy more than one, you get a readily good discount. The manufacturer of the Omni, Banale, offers discount packages for travel items that you can get along with the pillow. This pillow is definitely a must-try! I’m not a camping person (give me a hotel room any day, please) but my boyfriend loves the great outdoors. And so whether he wants to go to the mountains or sleep on a beach somewhere, I want to come with him. Better to be armed with good products like the Omni, so I’m well prepared to take my comfort with me! There must be a good reason why Mashable called it, “the Swiss Army Knife” of travel pillows. I have the opportunity to travel a lot in my line of work, and so I am always looking for ways to make the experience better and more comfortable each time I fly. Whether I’m flying for business or pleasure, my health and well-being are important to me, and I don’t want to arrive at my destination exhausted, or worse yet, with a pain in my neck, back or head. That’s why a good travel pillow is important to me. I’ve always used a u-shaped pillow, but I’ve recently read a lot of good reviews about the J-Pillow, and so I to tried it for myself on a recent flight to Sydney. The J-Pillow travel pillow certainly cradles your head well, but only especially if you’re sitting in a window seat. It doesn’t work nearly as well if you’re in the middle or aisle seats. Also, it’s rather big and bulky, which can be a problem if you’re traveling light or backpacking. However, this pillow is extremely comfortable. It’s soft but firm, and I really love the plush fabric the cover is made of. Another plus, the filling is of polyester fiber, which is much better than my u-pillow made of microbeads, which lose their shape and firmness over time. And, because of its unusual shape, there are many possible positions for using the J pillow — you need to try out for yourself what works best for you. But the point is that it supports the neck and chin equally, since the “J” part cups your chin, so it doesn’t fall too far forward when you sleep. I was surprised at how much this pillow let my neck relax. A word about its price though: you can get any u-pillow for as low as $5, but J-Pillow is not that cheap. A lot of people may be hesitant to spend that much on a just a travel pillow. The good thing is that the price includes a free carrying case. Comfort! This is number one, hands down. It gave me a flight that was pain-free. It has the right mixture of softness and firmness, and the plush cover actually felt almost luxurious. Doesn’t work so well if you’re not at a window seat. The unusual shape makes it bulky, which is hard for those traveling light. And some may find it expensive. It’s a must-have for frequent travelers! It’s worth the small investment to travel in comfort, believe me. I love it, and will never go on long-distance flights without it again. Here’s a suggestion if you’re thinking about getting one. Find a friend who has one, and ask if you can borrow it overnight. That way, you can try it out while riding your car or even sitting in a chair and see which position to put the J Pillow in that fits best for you. Read a book, and try to take a nap. You’ll be surprised at how comfortable and relaxed you’ll be. There’s a reason why this pillow won Best Consumer Invention in the UK in 2013. How important is a good travel pillow anyway? Well, ask yourself if getting good rest and sleep while flying for hours in a cramped position is important to you, and there’s your answer. My boyfriend and I are in a long distance relationship, which means several times a year either one of us is taking 8 to 12-hour flights across the ocean. So naturally, traveling in comfort is very important. I’ve gotten headaches and neck pains from sitting in a tiny airplane seat for too long, and so recently I bought a trtl travel pillow to help me travel in comfort. The first thing I’ll say about this pillow is that it doesn’t look like a pillow. Its design is sleek and stylish, and comes in black, grey and red. Instead of the large and bulky u-shaped pillows that you see everywhere, the trtl looks more like a scarf. It’s made of fleece and wraps completely around your neck — from your ears to the tops of your shoulders. Built into the design of the trtl are lightweight plastic ribs that keep your neck stable and supported. It’s lightweight and the cover is machine washable. It never looks dorky, like big bulky travel pillows do. Is it comfortable? Yes, definitely. Most importantly, I slept really well, and woke up rested and refreshed. For a lightweight product, I’m surprised at how well it supported my neck. Bonus points for keeping out unpleasant smells because I could completely cover my nose with it. I was seated near the bathrooms on the last leg of my flight, and well, let’s just say it didn’t always smell nice. Having said that, I do have to say that when I was traveling back to the US this summer, my neck got really hot, which made me itchy. The trtl covers your ears all the way to your shoulders, and if the air conditioner on the plane isn’t that cold, you can get uncomfortably warm. Also, I couldn’t put on my large, noise-canceling headphones properly because the trtl takes too much space near my ears. Some people may find the price point a little off-putting. Excellent neck support. Who would have thought those plastic ribs were so strong? On warmer flights it can get too hot, and what’s the point of having a travel pillow you can’t use? If you care about flying in style — this is definitely the travel pillow for you! It’s an excellent innovative product, and I really appreciated the good sleep I had when I used it. It’s soft and warm and comfortable, you couldn’t ask for anything more in a travel accessory. Plus, if you’re traveling somewhere really cold, you can even use the trtl as an actual scarf! Now, I got mine a few days before I actually flew, and so I was able to test it out to see how to put it on comfortably. Bear in mind that there’s very little space in your airplane seat to move around, and so you may want to try the trtl before you fly. The Cabeau – travel pillow evolution? The Cabeau is the one of the newest travel pillows available on the market today. It’s consistently getting good reviews and ranking high on “Best Travel Pillows” lists. So I decided to check and see what the hype is all about. Is this “evolved” pillow really all that great? Or is it, pardon me, just full of hot air? And if style matters to you, the Cabeau comes in ten colors and designs so it’s great for both men and women, including a camouflage design and one with flowers. The pillow cover is made of velour and can be completely removed so it can be washed. And it can be folded to a quarter of its size and put into its own carrying case for convenience. As a sweet bonus, the manufacturers have thrown in a set of memory foam earplugs to drown out noises on the plane so you can sleep sweetly. Plus it has pockets for your phone, keys, etc. The manufacturers are so concerned about customer satisfaction that they will return any pillow that breaks or is defective. So! What are you waiting for? We should all order one today, right? Not so fast. First of all, the Cabeau is rather large and bulky, and unfortunately only comes in one size. So if you’re smaller than 5’4 or so, this may present a problem. The back part of the pillow might simply be too big to fit properly. This means that the Cabeau shouldn’t be given to children or young teenagers as a gift. And, like other large traveling pillows, because the back portion is rather high, you can’t wear noise-cancelling earphones when you’re using the Cabeau. For people who can’t travel without their earphones, this is a definite problem. 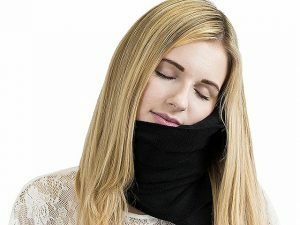 Others have remarked that they get too warm around the neck when using it — and everyone knows that to sleep comfortably you can’t get too warm. And finally, there’s the price. Some people who feel that forty dollars are too much to pay for a travel pillow. It really is a great travel pillow. For me, the pros outweigh the cons by a mile. 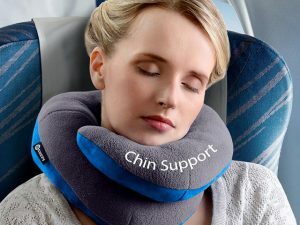 Especially for people who need neck support, and let’s face it, we all do, this is a good investment. Good rest on a flight is rare, and any product that contributes to it deserves praise. I appreciate that the manufacturers put a lot of thought and care into its design—in addition to comfort and neck support, it’s washable, portable, and has great freebies. You’ll never design something that will please everyone, but this product is hands down, a solid choice for travellers. Another day, another travel pillow! 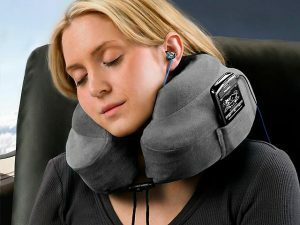 This time it’s the Aeris, a travel neck pillow that has holes in the sides in order to keep you cool while you sleep. Many travel pillows are extremely comfortable at the start, but the plush fabric and high cushioning around the neck to keep it supported can make the person using it feel really hot after a while. As you can imagine, this wakes the traveler up. So does the Aeris, which is supposed to keep you cool and relaxed while you sleep on the plane, really do its job? 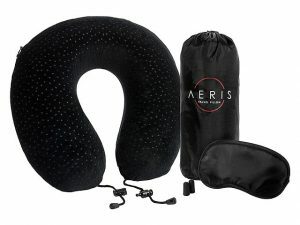 The Aeris travel neck pillow is made from memory foam that its manufacturers claim has been aerated for a full week, in order to remove any rubbery smell. This, right away, is a huge plus already. But the biggest advantage here is that this pillow has ventilation holes for good airflow so that when you use it, you can be assured of keeping comfortably cool, and therefore, sleeping well. It can be folded and packed away into its compact carrying case and comes with a free eye mask and earplugs. Plus, the comfortable velour cover is fully removable and machine washable. And it comes with a lifetime free replacement guarantee — very sweet. While there are many advantages to the Aeris, some customers have taken issue with the pillow and bag’s construction. Apparently, these are not hardy as they could be, getting damaged easily after just a few uses. Also, some people are having a hard time folding and fitting the pillow into the carrying case—citing that the case is really too small for the pillow, especially for newer purchases. The Aeris is a great way to keep cool and relaxed while traveling. I’m a person whose neck gets hot really easily, and then I get uncomfortable and even itchy. I loathe the idea of my sleep being interrupted in the middle of a flight because of a too-warm travel pillow, and so somebody actually coming up with a solution to this problem automatically earns high marks in my book! I love the idea of a ventilated travel pillow. That, plus the fact that it comes with an eye mask and earplugs, tells me that the designer of this product is bringing it to the next level. Excellent neck support plus comfort equals good sleep and waking up without any pain in the neck. Now, this is a product I can really get behind. Has Crafty World – Crafted the Best Travel Pillow Yet? Frequent travellers are always looking for the best travel pillows in the market, and some actually claim to be useful even for everyday use at home. Crafty World’s travel pillow’s creators say that their travel pillow has been tested and proven to be the very best pillow for sufferers from frequent pain in the neck, shoulders and upper back and that it can be used for additional comfort at home or in the office. If that’s all true then it sounds like a pretty wonderful product. Let’s take a look and see. 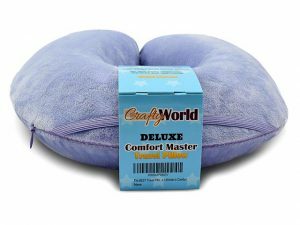 Crafty World’s Comfortable Travel Pillow is reportedly filled with thermally sensitive memory foam of the best quality, making it mold to the shape of your neck for the most comfortable fit. 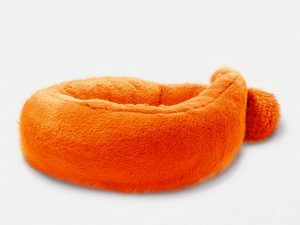 It comes with a removable cover made of velour and microfiber that’s easily washable and is very soft to the touch. It’s easy to imagine airplane passengers cuddling up with this pillow. It’s supposed to maintain the right head and neck alignment, so that the people who use it can stay pain-free, whether they’re flying, relaxing at home or even working at the office. Since some jobs require people to sit at their desks staring at the computer in one position for many hours, I can see the value in this. It has an elastic band that can be attached to your bag or luggage and is relatively compact at 12 x 11.5 x 3.5 inches. The manufacturers say that it can even be a really good gift for older folks, or perhaps used by people recovering from surgery or experiencing neck and back pain or injuries. Sounds really good, right? It’s a pillow that multitasks and can be used for travelling, at home or the office. Plus, it comes in different colors, so you can choose a color that suits your style. It also has a five-year replacement guarantee. But is it as good as it’s touted to be? Apparently, a lot of people think so. The main problems with this pillow is that some find it to be too thick, and it ends up pushing the chin too far forward, which could cause head and neck misalignment. And when this happens, the result is some form of neck pain or another. Perhaps this is not a pillow that’s good for smaller or younger people. A few others found the pillow to be poorly made, suggesting that the manufacturer may have quality control issues. One final suggestion is that the pillow could use a closing apparatus in front, to prevent it from moving around when the person using it is asleep. 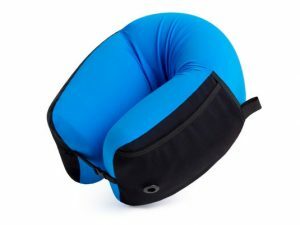 What I love about this comfort travel pillow from Crafty World is that, whether you’re traveling or not, it offers great neck support especially for people with a history of health issues with their necks, shoulders, and backs. People who are recovering from surgery use this pillow at home—which speaks to its quality and comfort. I would highly recommend it for those who are prone to neck pain and have a history of such. True confession time — I’ve never met an inflatable travel pillow that measured up to ones that are filled with microbeads or memory foam or any other material that you don’t need to inflate to use properly. However, since I don’t want to bring any check-in luggage for trips shorter than 2 weeks long, and I still want to bring my own pillow, I figure that it’s time to see what’s new in inflatable pillows. And AirComfy’s Daydreamer inflatable pillow seemed a good place to start. First of all, I just want to say that today’s inflatable pillows are no longer the old-school fake velvety plush on top, plastic on the bottom kind that you need to blow up. Today’s inflatable travel pillows have gone hi-tech, and all you need to do with the Daydreamer is push a button from 30 to 60 seconds and, voila! Your pillow is all ready for use. The nice thing about the Daydreamer is that it’s got contoured neck support. It’s higher in places like the back, where you need more support, and lower on the sides, so you can comfortably use big headphones if you want to. Also — the fullness and firmness levels of this pillow is adjustable, which is really a big deal. With a push of a button, you can make it firmer or softer according to your own comfort, even while you’re wearing it. There isn’t a lot of room to move around in your airplane seat, so that’s great too. It comes in several colors, has a washable pillowcase, and when you’re done with your trip it easily deflates and fits into its small pouch, which comes with a clip that you can attach to your luggage. Having said all that, let’s look at the product’s negatives. Unfortunately, the Daydreamer seems to have some quality issues, as a few buyers have said that the inflation/deflation controls broke after just a few times that they used it, and others complained of a leak. Also, at 11 x 11 x 3.5 inches when it’s fully inflated, this pillow may be too small for bigger people. A few men remarked on this when they used the Daydreamer. Generally, others did not find to be as comfortable as a regular travel pillow, but perhaps that’s asking a bit too much from an inflatable. As far as inflatable pillows go, the Daydreamer is a really good option. When you need to pack and travel light—this is the way to go. And I love it that you can adjust the pillow’s thickness and firmness even while you’re using it. And storage and portability are a big plus. Having said that, this is probably not the best choice for people with a history of health issues in their shoulders and necks, better to invest in a non-inflatable pillow for excellent neck support to ensure spinal alignment. The price point on the Daydreamer is also something to take note of — at present the model in black is at a discounted price. The other colors, however, can be bought at the regular price. I’ve also been on the lookout for more affordable travel pillows. With traveling, sometimes it’s easy to lose things, or sometimes you’re forced to leave some of your possessions behind, especially when you’re traveling light but you bought nice things at the place you visited. Sometimes you run out of space in your bag or are about to exceed the weight limit on your carry-on luggage, and you don’t want to pay excess charges. Yes, I’ve been there too. And so, it’s a lot easier to leave a travel pillow that costs around ten dollars, than one that costs between $30 to $50, right? And so, enter Hawkko’s Inflatable Travel Pillow, which only costs less than $15. This is a really good price as far as travel pillows go. 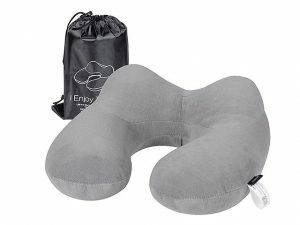 The manufacturer promises sufficient neck support, and the pillow is also contoured in the back, unlike many generic travel pillows that just follow the U-shape. It’s lightweight and portable, and it comes with a small string bag for easy stowing and carrying. It also has double valves so that it can be inflated by blowing into the valves in as fast as a few seconds. It comes in four colors, light and dark blue, pink and silver grey, and, like all inflatable pillows, you can adjust it according to your preferences. The manufacturer advises that the pillow be blown up from 75 to 90 percent of its capacity for maximum comfort. It’s small, reasonably priced, easy to inflate and deflate, and the outer cover is washable. While a lot of people have been happy with the level of comfort this pillow from Hawkko offers, there are a number who are less than thrilled with it. Some can’t seem to get comfortable using it, no matter how much they inflate or deflate the pillow. Some others needed to inflate the pillow several times during a lengthy flight. And unlike other inflatable travel pillows that can be inflated or deflated, while the person is using it, this one needs to be removed in order for the fullness to be adjusted. Therefore, there is a little bit less convenience to the user. Still, others complained that the fabric of the cover of the pillow sheds on their clothes. And there were also several others who complained that the valve plug was difficult to get in and out of its socket. You know the saying “you get what you pay for” is absolutely true, isn’t it? But price below $15 is a very fair price for an inflatable travel pillow. Overall it seems to be soft and comfortable, and many people have gotten good sleep while traveling with it. It’s light and small and convenient to carry around, especially for those who travel light. And, if you lose it or have to leave it behind because you bought too many souvenirs on your vacation, you won’t feel too bad. So we need to start exploring travel pillows that are out of the box, like VereTrip’s Memory Foam Travel Neck Pillow. It’s not U-shaped or even J-shaped, neither is it inflatable — in fact it looks more like something you have to use after you come home from the hospital. It has gotten amazing reviews from people who’ve bought and used it, however. Let’s see what they’re all talking about. The VereTrip Travel Pillow works by putting it on either side of your neck. It comes with a strap that you fasten under your armpit on the opposite side from where you placed the pillow. This way, your head, and neck are cradled gently but securely while you sleep. If you don’t sleep on your side but would rather lean back, you have the option of not using the straps and simply leaning back on the pillow, which is contoured to cradle your head and neck. The pillow itself is silver grey or rose red and is covered with a very soft and comfortable material. The filling material used is memory foam. At 7 x 7 x 1 inch and 8 ounces, it’s also really small, especially in comparison to other pillows. The compact size makes it easy to carry around and to stow. People who pack light appreciate this very much. And, because of its straps, it can also be attached to any backpack or carry on luggage. People who’ve travelled using U-shaped and J-shaped pillows have remarked that they work best when you sit in a window seat. With the VereTrip Travel Pillow, sitting in the middle or aisle seats is not a problem at all; because it offers so much support that when you use it you don’t need anything to lean on. It also comes its own travel bag and earplugs for added comfort. People also love the material, since it helps keep them warm. To be honest, this product has received five stars from Amazon reviewers almost uniformly. One reviewer gave it four stars, which is still a very high rating. They rave about the high level of comfort the VereTrip Travel Pillow has given them, with many remarking on excellent neck support. They’ve also said that they’ve gotten the best sleep while on a plane when using the VereTrip Travel Pillow, and that they no longer want to travel with any other kind of pillow. Apparently, it also works for passengers of all sizes, including children. The only negative comment I could gather was that it is a little pricey. But the thing is, it actually used to be even more expensive, so getting it at under $30 is a good deal. This product deserves a wow, in my opinion. I have never seen such rave reviews for comfort, good sleep, and value-for-money for any other travel pillow. Its innovative design contributes to getting wonderful rest while traveling, and it is soft, cozy and warm enough without being too warm that users get hot. It has all the advantages of a travel pillow without its disadvantages. Does World’s Best – deserve its name? Okay, time to look at some straightforward, traditional u-shaped pillows. The first one is from a company called World’s Best, and I was curious to see if it would live up to its name. World’s Best Feather Soft Microfiber Neck Pillow comes in more than two dozen designs, from plain colors to more fun, even whimsical patterns like polka dots and chevrons, which made me smile right away. As far as pricing goes, this travel pillow is reasonably priced, and if you order $25 worth of products from the World’s Best, they’ll ship your orders for free. The pillow is made of microfiber, and is proudly 100 percent American made. (Buy it and you help the economy.) It’s very soft and comfortable to lie on, and yet also provides neck support and is extremely durable. The outer cover isn’t just attractive but is cozy and plush to the touch. Best of all, it’s completely machine washable, which sets it apart from other travel pillows, most of which have only covers that can be washed. It is also 100 percent hypoallergenic. A lot of mothers buy these pillows for their kids, even for traveling in the car. And I must say that you’ve got to love products that mothers love too, right? It’s small and portable at 6 x 6 x 6 inches and only weighs a little over 11 ounces. So it should fit well in your carry on bags, and children should not have a hard time carrying it around either. It also has snaps in front that close securely, and so the pillow won’t fall off your neck and shoulders even if you move around in your sleep while flying. 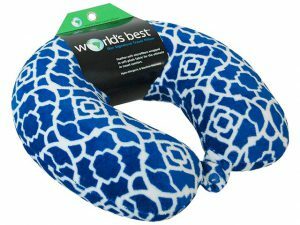 World’s Best has made a good, standard U-shaped travel pillow. It’s soft but firm at the same time, even after you’ve washed it a few times. However, here is where one of the problems with the products lies. A few commenters have said that the pillow may actually be too firm for them to sleep comfortably. They feel that this travel pillow may actually be overstuffed. Secondly, some have commented that the dimensions of the pillow may be too small, especially for larger men. They’ve said that when the button is clasped closed it can feel a little too tight. Attractive and decorative — with bright whimsical designs, as opposed to more functional travel pillows. I personally love the choices of colors and designs for this travel pillow. It’s refreshing after all the greys, blacks and other muted colors that other companies who make travel pillows offer. I also like that they’re a good size for children. The price is excellent, too. Plus this pillow is so easy to clean, just toss it in the washing machine and you’re assured it gets germ free. It may not be the world’s best in all ways, but it’s a great buy in so many ways. Is the BCOZZY – as Cozy as It Claims to Be? Our next travel pillow actually comes in a pair — and I wonder if it’s a not so subtle hint that traveling is best done with a friend or partner. Or, as the company’s name suggests, it’s cozier that way. The name alone intrigued me, and so I took a closer look at the product. BCOZZY’s Chin Supporting Travel Pillows come in black, blue, purple, red, pink and lime green. The company offers both child and adult sizes. They are shaped similarly to the traditional u-pillows but are longer, less wide, and the hole in the middle is considerably larger. This means that the pillow can be stretched from one end to another so that the person using it can twist it to the shape he or she feels is most comfortable. For example, the two ends of the pillow can be placed one on top of the other so that the person’s chin can rest snugly and securely on it. Or the two ends can be put on top of the other so that people who are used to higher pillows can get comfortable. The BCOZZY is completely machine washable and has a carrying strap that can be attached to luggage or carry-ons for easy portability. According to the manufacturer, the pillow is filled with Hollow Conjugated Siliconized Polyester Fiber. This pillow was so well received that it was a 2015 Travel Goods Show’s Best Travel Accessory Nominee. It gives excellent support to the head, neck, and chin when sitting down. The pillow is uniquely designed to hold both the chin and head securely; stabilizing it while the person using it sleeps. The adult sized pillow is 12 x 10 x 3.5 inches and the child-sized one is 9.5 x 8 x 2.5 inches. However, some users have found the BCOZZY to be problematic in some ways. One, the back area may be a little too thin for people who are looking for better neck support. The BCOZZY, after all, is long and thin rather than round and cushiony. Two, because this pillow goes completely around the user’s neck, others found that it got uncomfortably hot after using it for a while. The third area that people found objectionable is the price point, finding it somewhat expensive, even if it’s offered at a discounted price right now. The BCOZZY is an innovative twist on the traditional U-shaped travel pillow. Because it’s long and flexible, you can shape it however you prefer for your own comfort. I love it that the company offers both adults and children’s sizes, unlike the one-size-fits-all options other companies have. The unique design holds the head, neck, and chin firmly in place. However, it is a little costly, so I suggest that you keep all receipts and proof of purchase, just in case this product does not work out for you. • Are travel pillows worth it? The short answer is yes, they are totally worth the additional expense and baggage space. This is especially true for frequent travelers. The number one reason that travel pillows are worth it is that they help prevent the neck pain that occurs when your head, neck, and spine are misaligned. Just think about it this way: you save money and invest a lot of time on planning a great vacation—only for it to be ruined by pain in your neck. The right travel pillow that provides cervical or neck support will prevent this. • Are travel pillows comfortable? Yes, travel pillows are generally comfortable. In fact, they were built for that very purpose—to make travelers comfortable, and to relieve them from very uncomfortable neck pain. Now, having said that, the level of comfort you get from travel pillows does depend on the quality of the pillow you get, your sleeping style, as well as your own particular preferences of material (filling). So it’s good to shop around a little bit and read online reviews before actually buying one. • Can I use a travel pillow even if I have chronic neck and back problems? If you have medical issues in your neck, spine or back, it’s always best to talk to your primary care physician before using a neck pillow, since this pillow is expected to keep your neck and head in a certain position for several hours at a time. They can advise you as to what material and thickness are the best for your particular condition. If you have allergies to certain materials, make sure you bring this up to your doctor as well. • Are travel pillows safe for toddlers and small children? It is better to not use them for infants and toddlers. The main concern is that the travel pillow will cause the infant’s head to move too far forward, and possibly block his or her airway. But for children 4 years old and above, these can actually add to their comfort. Long flights are hard for everyone, but they are especially difficult for children, as we are sure many of us have experienced firsthand. Anything that adds to a child’s comfort is beneficial to everyone else on the flight. • For convenience, should I just pick up a travel pillow at the airport before flying? The answer to this is a resounding “No.” Along with everything else, travel pillows are much more expensive (as much as 2 to 3 times more) in airport shops than in drugstores or travel shops and so, in order to save yourself money, buy one way before you fly. This will help you determine how much space your travel pillow takes up in your carry-on anyway. • Are travel pillows useful? For frequent flyers and people who travel on long-haul flights, travel pillows are definitely useful. Many people have found that they not only add to comfort while flying but also actually minimize neck and back pain. For some, they are the best way to guarantee a good sleep while flying. For so many of us, traveling is a dream come true. We cherish dreams of being glamorous jet-setters. We all have our bucket list of destinations that we save up for in order to visit. We plan itineraries and look forward to amazing vacations. However, travel can come at a cost to our health and wellbeing, especially due to the cramped conditions of airlines and other public transport. Once spacious airliners have removed extra inches in order to add more seats. Often we’re required to stay for several hours in the same position in a very tiny, cramped area—and sometimes this results in adverse effects on our heads, necks, and backs. How many of us have woken up on a flight with a severe headache? Or with a dreaded stiff neck, or different strained muscles in at the in our necks and shoulders, just because of a poor sleeping position while traveling? This pain is caused when our heads, necks, and spines go out of alignment—something that happens easily and often in tiny airplane seats, as we twist our bodies to find a comfortable position to sit and sleep. The solution is traveling with the right travel neck pillow. We’re seeing more and more travelers in airports carrying the now ubiquitous u shaped pillow, right? A good one can make all the difference in the world. And that’s why we wrote this—to help you choose the best travel pillow for you, so you can enjoy your journey without neck pain and headaches. After reading this article, we hope that you’ll come away with a buyer’s guide of what to look for in the best airplane pillow—and look forward to rest and comfort while you travel pain-free. Now, this article is all about the best pillow to keep you pain-free while you travel. 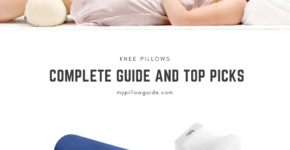 But if you’re someone who sometimes wakes up with a headache, neck or shoulder pain, I’ve got a very Special guide to choosing the best bed pillows for neck pain. It will help you get the pillow that will change your life and give you the best night’s rest so you wake up relaxed, refreshed, and ready for the next day! Best Travel Pillow: What causes neck pain when we travel? Our necks are made up of muscles, cartilage, tendons, and the seven bones that together form the cervical part of our spine. These seven bones are very small, and they’re not even connected together. They rest on a bed of spinal fluid and they perform a very important job—which is to protect our central nervous system. Our necks also hold our heads up, as well as allow us to move our heads freely. There are nerves running up and down inside this cervical column, from the brain to the different parts of our bodies. Our necks are extremely vulnerable, particularly when we sleep. The best way to avoid injury to our necks at night is to keep our heads, neck and back all aligned—and keeping our neck aligned with our body has everything to do with the pillow we use. That’s why the right pillow is so important. Think about it—if you carefully choose the pillow for your bed, wouldn’t you also carefully choose a good airplane neck pillow? In case you need more reasons for finding the best neck support pillow when you travel, here are some quick facts about neck pain. And for women, neck pain is something to especially watch out for, as you’ll see from the list below. Neck pain occurs in the muscles, tendons, and soft tissues (ligaments) around and in the cervical spine or the neck. This isn’t just unpleasant or uncomfortable, but can indeed be very painful at times. And if you are a frequent flyer because of work, the last thing you want to do is to compromise your health or be in constant pain because of having to travel for hours in a cramped space. And if you add changing time zones into the mix, which contributes to jetlag and all the discomfort that comes with it, and the actual journey can take some fun out of traveling. The solution: the right travel pillow! The good news is that using the right pillow for neck pain when you travel can help solve these problems. Even in your own bed, the right pillow can make all the difference between comfort and discomfort, and waking up rested or waking up with pain. It seems that more and more travelers these days, especially women and children, are bringing their own special neck pillow for traveling. And with the toll traveling takes on our bodies, who can blame them? What can the right travel pillow do for you? Here’s a secret — we are all different, and we all sleep in different ways and positions. Some people sleep on their backs, others on either the left or right side. And some others actually sleep on their stomachs. Naturally, the position in which you sleep will determine which muscles in your neck are affected while you sleep. Researchers at Harvard University say that sleeping in your back or side is actually healthier than sleeping on your stomach because this position forces your neck to be on its side all night long—causing considerable neck strain. Sleeping on your stomach also causes your back to be arched, which could also strain your back muscles. If you sleep in this position and are constantly noticing pain or strain in your neck and back, perhaps its time to train yourself to sleep in a different position, being mindful to try to fall asleep on your back or side. But since it’s easier said than done to correct longtime habits that we’re comfortable with, one option for stomach sleepers is to use a side pillow for added support for the neck and back. And so, let’s go on and find out what to look for in a Best Travel Pillow. Why did we draw up this list in the first place? Well, like we said at the beginning, since travel is becoming more and more accessible and affordable, more people are traveling long distances, which also means more people are susceptible to neck pains due to misaligned heads, necks and spines due to cramped traveling conditions. Since we don’t want anyone’s vacation to get ruined, or worse yet, for anyone develop what a serious health condition, we decided to draw up a buyer’s guide — a practical list of what to look for in the best travel pillow for you. There are a number of cervical neck pillows available in the market, the most common one that you see everywhere is u shaped pillows that are for sale in airport shops, drugstores, etc. While we will save going into a discussion of specific brands for another article, we will outline for you the different criteria that we used in choosing the best travel pillow, and these are: shape, size and weight, material (filling), price, and durability. Similar to our sleeping styles in our own beds, our sleeping styles while traveling are also quite varied. Some people choose window seats so they can lean on the window as they sleep. People with longer legs need to stay in the aisles, and therefore cannot lean as they sleep, and so need more support to keep their heads still. Others sleep with their heads back, while some literally nod off with their heads falling forward. Therefore, in determining the best airplane pillow for you, you need to identify the position in which you sleep best while traveling. What to look for in a Best Travel Pillow? Determine what shape is best for you. The standard u shaped pillow works well for most people, and if you fly infrequently, having a standard u shaped pillow that you can get anywhere should be okay for starters. It provides ample support and since it cradles the back and both sides of your neck, it will keep your neck from rolling around.But if you are a frequent flyer, or you have health issues, or if comfort and a good sleep are very important to you, you can choose between J shape, rectangular, wraparound, sash-type or even circular travel pillows. The J shape is supposed to provide even better neck support than the regular u shape pillow, as it holds your head and neck more securely. The rectangular pillow is a small travel pillow similar to the one on your bed. It’s easy to lose a rectangle shaped pillow while you’re asleep on the plane since it has nothing to be anchored on, unlike u shape, which is anchored on your shoulder. Wraparound travel pillows cover the whole of your neck, from chin to shoulders, for maximum comfort. No matter what position you fall asleep in, your neck is fully supported. The sash-type pillow is draped across your chest, so your cheek and chin can rest on it while you sleep. Circular pillows can be placed around your neck, providing firm support, or perhaps wrapped your eyes and ears, to block out light and sound. However, your neck is left without support if you do this. Travel pillows also come in many sizes. There are inflatable small travel pillows that come in rectangular shapes that can be compressed and are ideal for camping trips, to a much bigger sash-type inflatable pillow that you drape across your chest for your head to rest on for sleeping. As for weight, inflatable pillows, of course, are the lightest, while microbead and memory foam pillows are heavier. Since airlines are very strict with weight restrictions nowadays, it’s good to know how light or heavy your travel pillow is. As mentioned earlier, travel pillows can have a variety of fillings. For people who travel a lot may want to invest in a memory foam pillow that contours to the shape of their heads well. Microbead pillows are made up of thousands of tiny beads as the stuffing for these pillows, these are very common, but tend to sag after a while. Inflatable pillows have a plastic inner lining, but usually, have a more comfortable outer cover made of fabric. Finally, let’s talk about prices. Travel pillows you can buy at the airport or drugstore can cost as little as 5 to 8 euros (or $5). However, more specialized and high-end travel pillows that promise greater comfort can cost as high as 50 euros (or $65). A final word — you may want to consider how easy it is to clean your travel pillow as well, since airplanes are probably not the cleanest places in the world. If your travel pillow has a fabric cover, no problem, it should be machine washable. Microbead pillows can be washed either by hand or on the gentle cycle on your machine, whereas memory foam pillows should never be put in the washing machine. The best thing is to run water through it until it runs clear, and then air dry. There are a lot of joys in traveling, but sleeping in a cramped airplane seat can be a literal pain in the neck! The good news is that better and better airplane neck pillows are currently available, and there are indeed many to choose from that suit your needs and sleeping style the best. 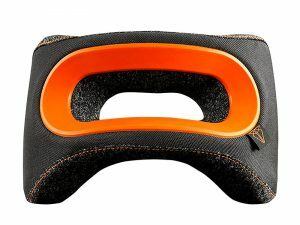 In the above article, I reviewed the latest models available so you can choose the best neck support pillow for you. Thank you for all the individual reviews! 😀 I just moved to Thailand… but will be making many long journey’s back to Canada to visit my family. On the way here, I realized how nice it would be to have a travel pillow. I do think it is a really important to have a comfortable pillow for travelling. I’m sure we’ve all had those times where we get a really awkward seat on a plane or bus and we have those terrible neck cramps when we get off. The U shaped ones are the most popular ones I’ve seen and they seem the best. That Cabaou one looks insane, do you own one and if so which one do you own? Thanks for sharing these travel pillow recommendations. I’ve been trying to find a good travel pillow as my last one wasn’t comfy at all. Some of these seems like great innovations that said they also look big and quite stuffy. I see a lot of folks carry a smaller air filled travel pillow and wondered if those are a good choice? 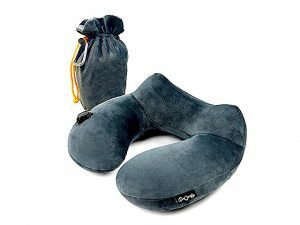 Thank you very much for sharing this invaluable information to help people like me choose the best travel pillow good for my health and also comfortable to use. I prefer the neck pillow which goes over the shoulders because I get a lot of discomfort around my neck area each time I go on a long flight. I’m also tempted to go for the inflated pillow. It sounds equaly good. Which one would you recommend? I enjoyed this article as I travel and fly a lot. My advice would be not to leave buying a travel pillow until you get to the airport as they are always overpriced there. From these I think I would like the one that keeps the neck warm. It sounds cosy and comfortable to me. Thanks for all the reviews, very helpful. This is quite a bit of information about travel pillows. I had a small U shaped pillow, but wasn’t the most comfortable. Maybe I needed a bigger one or a J shaped pillow like you mentioned here. I’ve heard of the memory foam and of course the air pillow, but don’t think I’ve heard of the micro bead fillings. Thanks for the information!